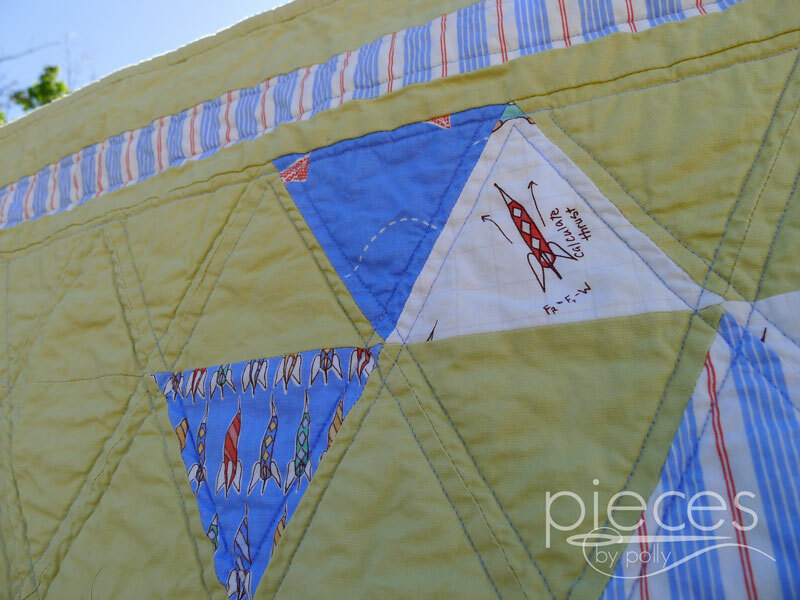 I finished up this Children at Play Boy Quilt a couple months ago, but just haven't gotten a chance to blog about it until now. This quilt is available for purchase in my Etsy shop here. 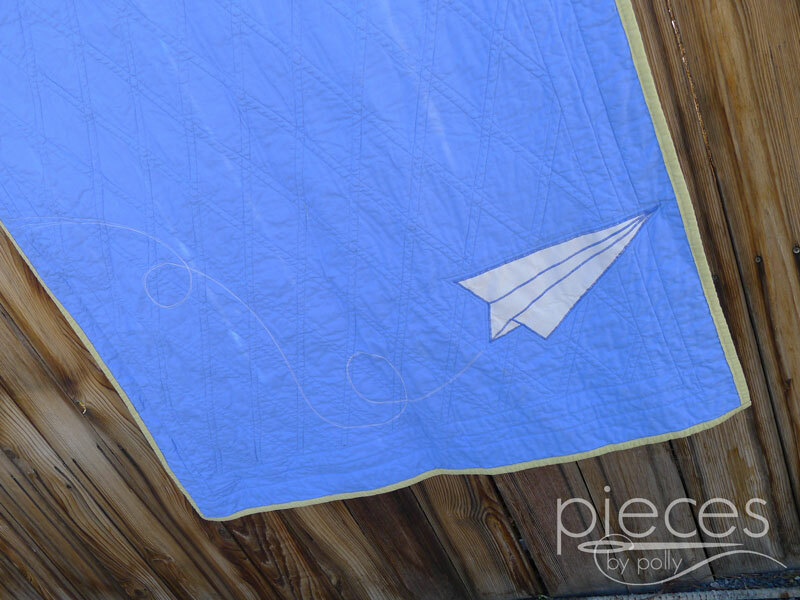 Children at Play by Sarah Jane Studios is one of my favorite fabric lines ever...especially the prints with boys doing brainy things like playing with rockets and paper airplanes. Unfortunately, they're getting pretty hard to find. So about a year and a half ago I tracked down as many of the boy prints as I could, and I started a twin sized Children at Play quilt for Anson. 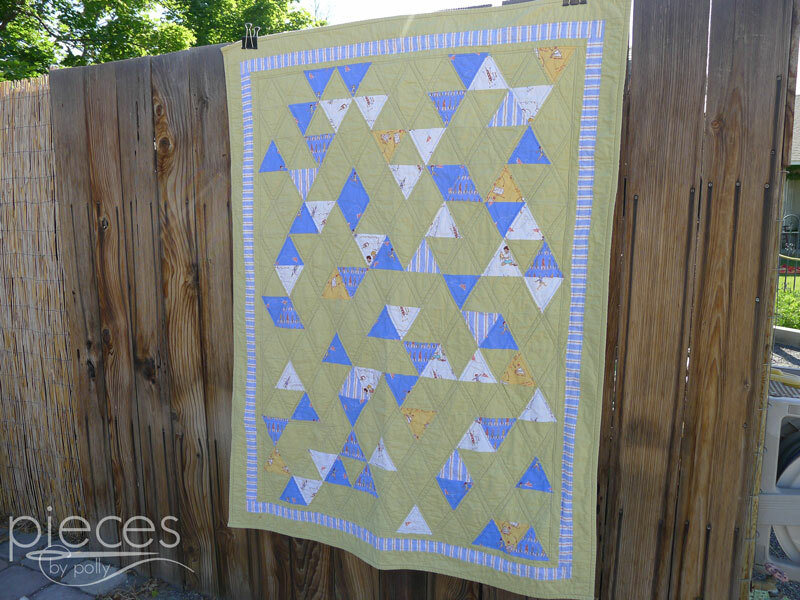 That quilt is still not finished...but cutting it out gave me all these yummy left-over triangles. I love contrast, though, so I didn't want to use the white prints with white background triangles. 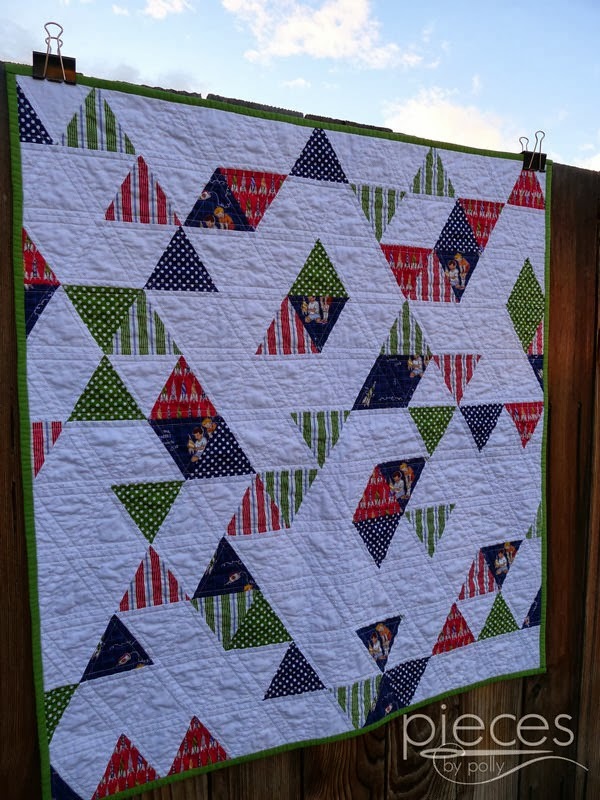 I saved all the white prints and less bold "Over the Fence" colored triangles to use in this quilt. 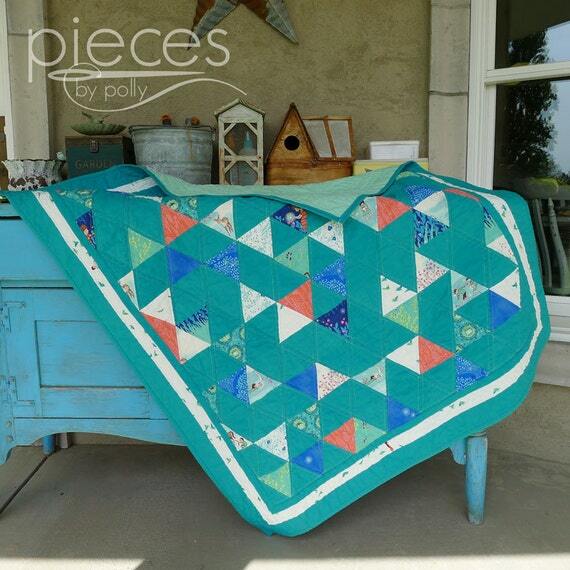 The solid triangles are Kona Cotton in Celery. I also decided to add a border on this one to make it a bit bigger and frame it. I've traditionally not been a huge border person...but they're definitely growing on me, as I've added them to quite a few of my recent quilts. 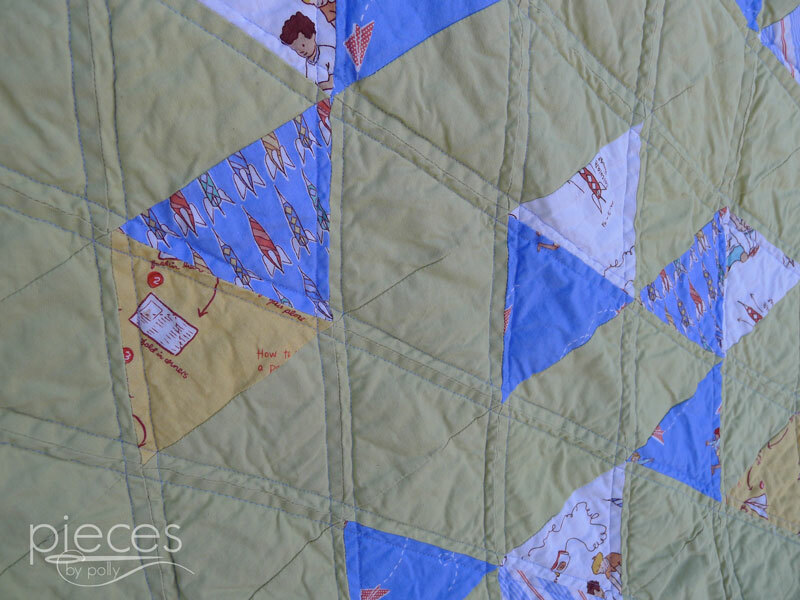 And perhaps my favorite feature of this quilt is the paper airplane on the back. With so many boys chasing paper airplanes on the front, I thought a paper airplane for the back would be just the thing. I usually do an accent strip on the back to add some interest, but since this one has the applique, I skipped the accent strip. I was a little concerned about how the whispy tail would show up after I did the quilting. It's just stitched with white thread. I sewed it three times, not quite overlapping. 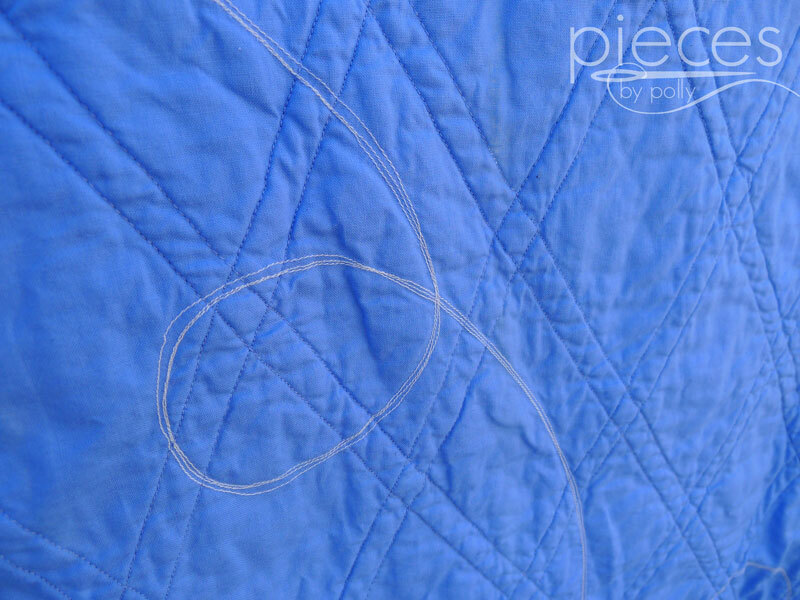 I did the quilting lines in blue quilting thread so as not to disturb the tail lines. I worked from the back and sewed around the paper airplane first. 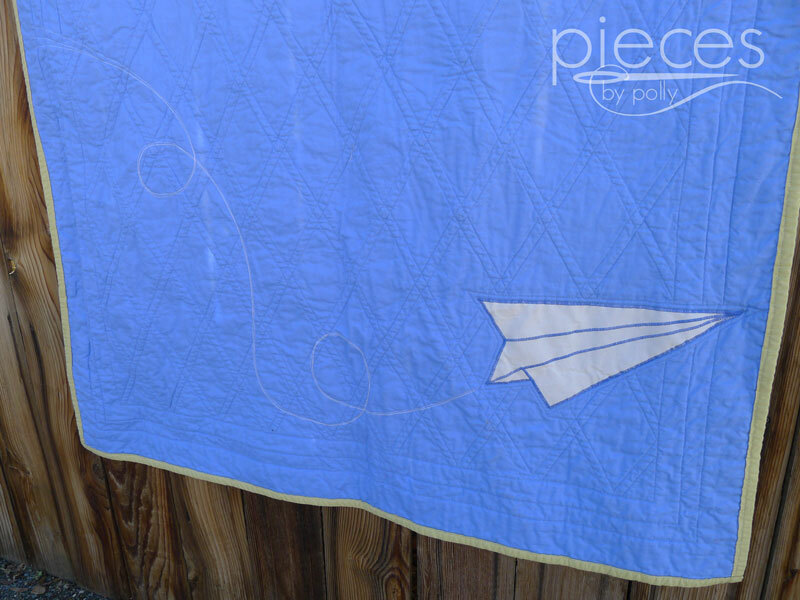 Then I flipped it over and quilted it from the front on the diagonals to make a diamond pattern, stopping at the line around the paper airplane, so there aren't any quilting lines going through it. One of my favorite things about patterns like this is that there are really only some general guidelines rather than a set pattern. 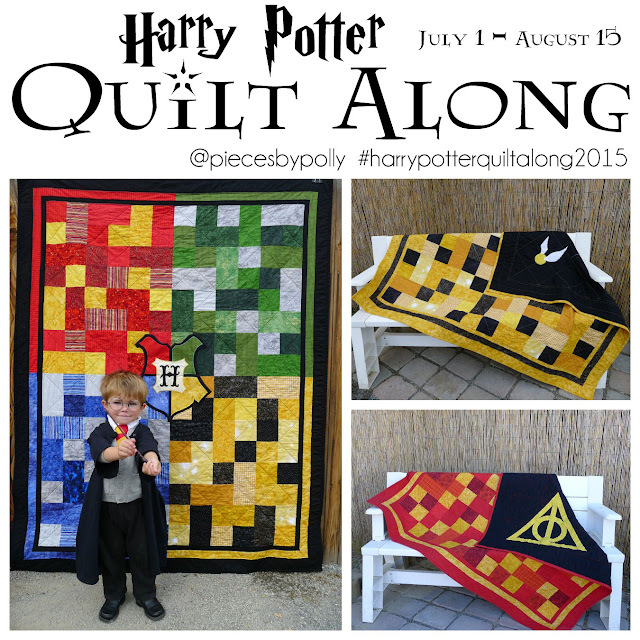 I based it off of this quilt from Lee at Freshly Pieced. 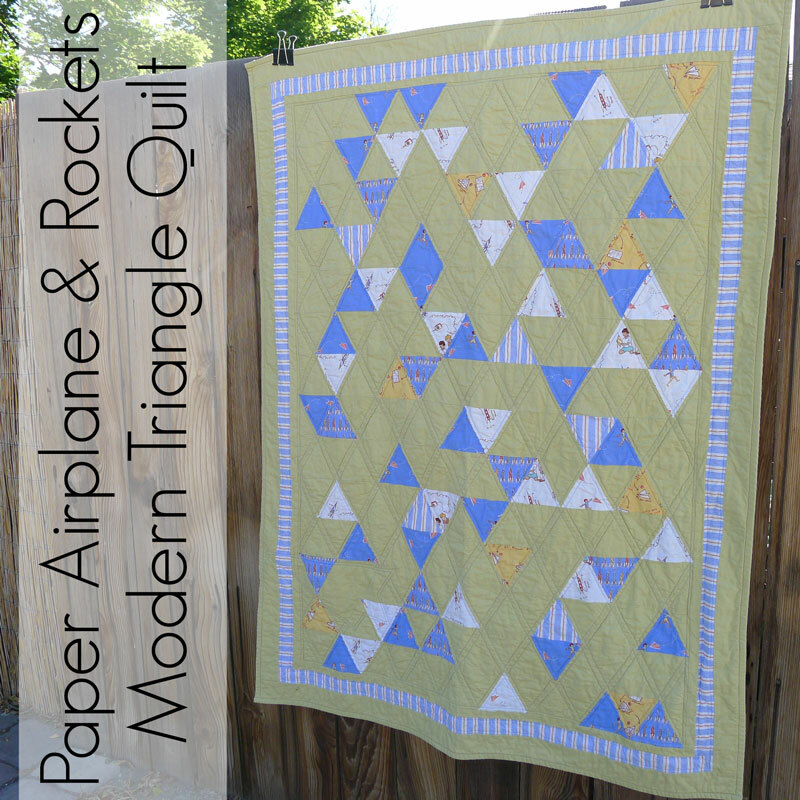 I've made three of these triangle quilts now. I use an approximate ratio of about 2/3 solid triangles to 1/3 prints and it seems to keep the quilt interesting without being to busy. 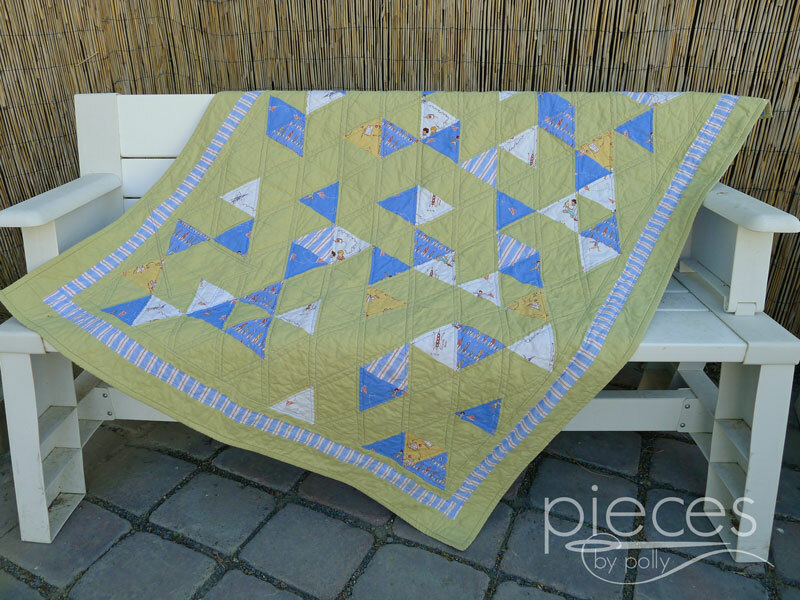 I also try to have a few "clumps" of triangles here and there and also have the spread in a balanced way across the quilt. 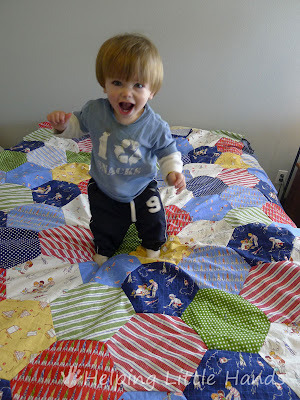 What fabrics would you use for a quilt like this? Love It! The paper airplane is a definite plus! It looks like you are having lots of fun, and hopefully selling some too. I have a fun fabric called Noddy and Friends I have been wanting to make up for some time - when I get time. Full of rocket ships and bright boy colors! 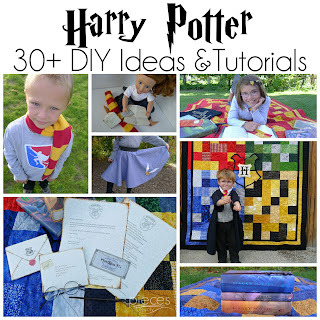 First time visitor through "Fabric Tuesday" and I already love what you posted! I think the paper airplane is a brilliant addition and is a bit of a suprise (as usually you will see some accent fabric, but not more). I could see this pattern with some Heather Ross Briar Rose since the hexagons formed from the triangle look like unfilled bee hive holes. Anyway...I'm a new follower on Feedly and can't wait to see what you make next. I love this Sarah Jane line too. 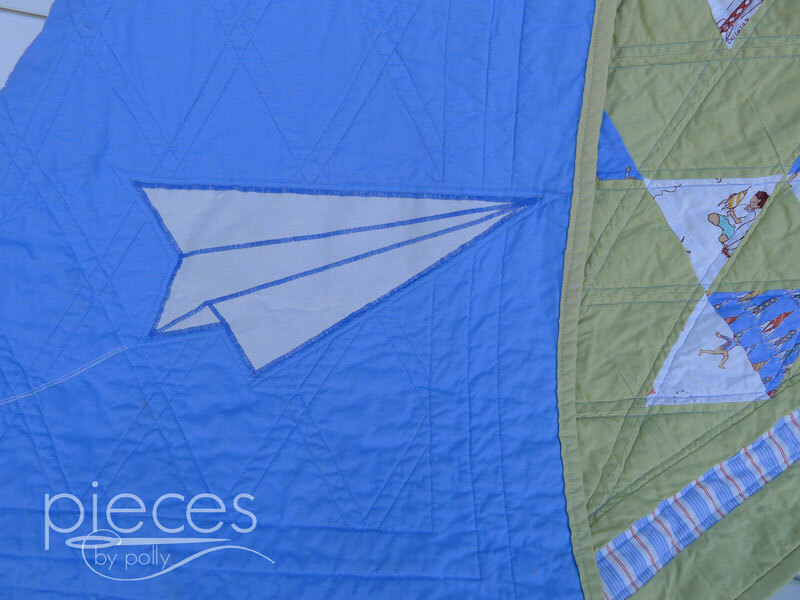 I'm hoarding the paper airplane fabric in a couple of colors and a tiny bit of the pinwheels. Doing a triangle quilt with these was an excellent choice.